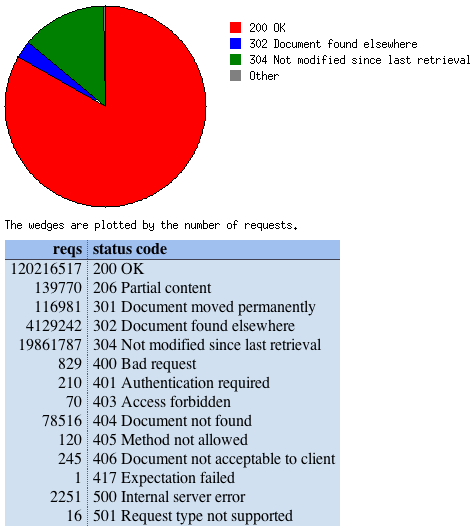 When you run your log analysis tool, you’ll probably see a lot of requests with an HTTP code 304 (not modified). These requests are coming from browsers which check that the data in their cache is still current. Check here if your server uses cache control. If it shows that there are unnecessary server connections, then it’s about time you enable cache control on your site. It be enabled in your .htaccess file (if you’re running Apache as your web server) or in the web server configuration (httpd.conf, virtual host configuration). Notice the number of 304 requests. Many of these connections can be avoided when using Cache Control. I only recently started using Cache Control in order to reduce the load on my servers. This is especially useful if you’re re-using the same scripts, stylesheets and images over and over again throughout your site. Browsers can just skip verifying those files on each subsequent page they load. This entry was posted on Wednesday, September 5th, 2007	at 22:28	and is filed under Technical	. You can follow any responses to this entry through the RSS 2.0	feed. You can leave a response, or trackback from your own site.